Artificial Flowers, Gift Packing and Bag Handle. Features Our Paper Rope are very suitable to apply to Artificial Flowers, Gift Packing and Bag Handle. 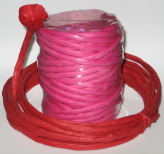 Our Paper Rope have various colors for you to select. Expect that, strong material and saturated colors also will let you satisfied. Our Paper Rope only made in Taiwan, and we assure you that you will satisfy our quality and competitive. If you would give opportunities to start cooperation relations, we assure you will satisfy our services.